Depart any Tuesday, Wednesday, Friday and Saturday! We are family tour specialists. Our preferred Galapagos boats are the Galapagos Legend, the Coral I and the Coral II. Click here for more information on these ships as well as 4 and 8 day cruise options. Visit Machu Picchu, one of the New Seven Wonders of the World, as well as Cusco and the Sacred Valley, and then take a five-day Galapagos cruise. Our most popular Galapagos itinerary visits the islands of Bartolome, Isabela, Fernandina, Santiago, Rabida and Santa Cruz – a great combination of wildlife viewing, remote visitor’s sites and fascinating volcanic formations. Day 1: Arrive Lima. City tour if time allows. Day 2: Flight to Cusco. City and ruins tour. Day 3: Sacred Valley tour – Pisac and Ollantaytambo. Day 4: Machu Picchu Tour. Day 5: Morning flight to Lima then onward flight to Quito or Guayaquil. Day 6: Flight to the Galapagos Islands. Transfer from Galapagos airport to cruise ship and first excursion today. Day 7-10: Galapagos cruise continues, visiting Isabela, Fernandina, Santiago, Rabida and Santa Cruz Islands. Flight to Quito (or Guayaquil) on day 10. International flight can depart today after 5pm. A short flight brings us to the famous Inca city of Cusco. After checking into your hotel, we set out to explore the incredible capital of the Inca Empire. We head to the picturesque Plaza de Armas to the fascinating cathedral to see the colonial influence in the city, and we can admire the stunning architecture of the church and also the native influences subtly woven in into the artwork. Onwards to Qoricancha church, where the colonial and Incan architectures are on display side-by-side directly contrasted with each other. Afterwards we make our way above the city to the imposing fortress of Sacsaywaman where we can marvel at the incredible stonework and architecture of the Inca civilization. We head back to Cusco in the late afternoon. This morning we take a short and scenic ride in our private transport to Pisac and Ollantaytambo, two important Inca ruins in the Sacred Valley. After visiting the site of Pisac, we’ll head down to the colonial town below and visit its famous crafts market. We then continue on to Ollantaytambo. Besides the huge and fascinating ruins above the town, Ollantaytambo is the only Inca village still inhabited today. Walk its narrow streets and peer through huge Inca doorways into courtyards where life has changed little in over 500 years. Afternoon train to Aguas Calientes, below Machu Picchu where we’ll spend the night. Sunrise at majestic Machu Picchu! Known as one of the greatest architectural achievements in the world, this historic sanctuary is considered one of the seven manmade wonders of the world. 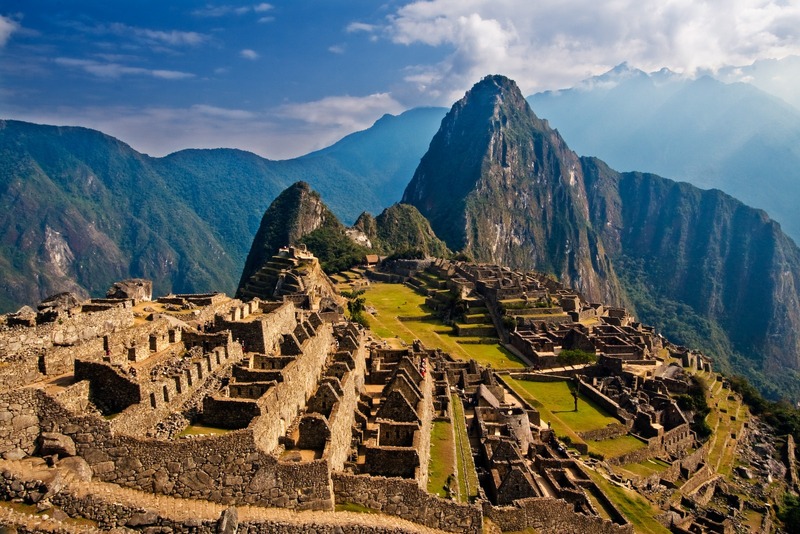 After a guided Machu Picchu tour, take your time and enjoy this magnificent place. During peak visiting hours (10-2), try a hike on one of the surrounding Inca trails on Wayna Picchu or Machu Picchu Mountain. Return by train and car to Cusco in the evening. Morning flight to Lima and then an onward International flight to Guayaquil (or Quito) and transfer to your hotel. Galapagos (Baltra Airport). Departure from Quito or Guayaquil to Baltra (aprox. two and half hour flight). Passengers will be picked up at the airport by our guides and taken to the pier to board the boat. such as herons and lava gulls. Most of the islet is covered with sand and barren lava rock. Egas Port (Santiago Island). Wet landing. This visitor site located at the northwestern portion of Santiago Island, and of important geologic interest, features extensive lava flows believed to have been formed during the last quarter of the 19th century. Egas Port´s black volcanic sandy beach was visited by Darwin in 1835. The unique, truly striking layered terrain is home to a variety of animals including the bizarre yellow-crowned night heron and marine wildlife including lobster, starfish and marine iguanas that graze on algae beds alongside Sally lightfoot crabs. Often you will see colonies of endemic fur seals swimming in cool water volcanic rock pools. Afternoon: Rábida Island. Wet landing. Dark-red sand covers these unique beaches with incredible landscape; Rábida Island is considered the epicenter of the Galapagos Islands due to the diversity of its volcanic geology. Nesting Brown Pelicans are found from July through September and nine species of the famous Darwin’s finches can be seen. We will also take a dinghy ride along cliffs to observe nesting seabirds, and snorkel off the coast, where marine life is particularly active. Today you will have the option to go snorkeling. Urbina Bay (Isabela Island). Wet landing on a volcanic “black” beach. Depending on the time of year we may find giant tortoises, large land iguanas and the unusual Flightless Cormorant at their nesting sites and Galapagos Hawks. After the walk inland, snorkeling time is allotted, giving you yet another chance to swim with sea turtles, sea lions, penguins and countless tropical fish. Urbina Bay features a wide variety of plant life that changes depending on the season. We can observe the beautiful colors of plants that attract different insects, birds and reptiles. We will explore the uplifted coral reef that resulted from 1954 volcanic activity, with a spectacular view of Alcedo Volcano. Afternoon: Tagus Cove (Isabela Island). Dry landing on Galapagos’ largest island where we will learn about the eruption of the five volcanoes that form it. The trail leads to Darwin’s salt-water crater Lake and excellent views of lava fields and volcanic formations. We will return by the same path for a dinghy ride along a shoreline full of marine wildlife, where we will admire a variety of seabirds, such as Blue-footed Booby, Brown Noddy, terns, Flightless Cormorant and depending on the season, a large number of Galapagos Penguins which are only 35 cm. tall; the only penguin species in the world to extend its range into the northern hemisphere along the equator. They are monogamous and lay their eggs in small cracks of lava, on the lower parts of the island near the shoreline not reached by the ocean waves. The population of penguins on the islands is about 2,000 individuals, most of which live on this western portion of Isabela; others are scattered further south on the island. We will have an opportunity to snorkel in deep water. Graffiti believed to have been left by 19th-century pirates is a curious reminder of an intriguing past. Espinosa Point (Fernandina Island). Dry landing. Espinosa Point is the only spot that we visit on Fernandina, and from it we can see the island of Isabela across the Bolívar Channel, an area that boasts some of the highest diversity of endemic sea fauna in the Galapagos. 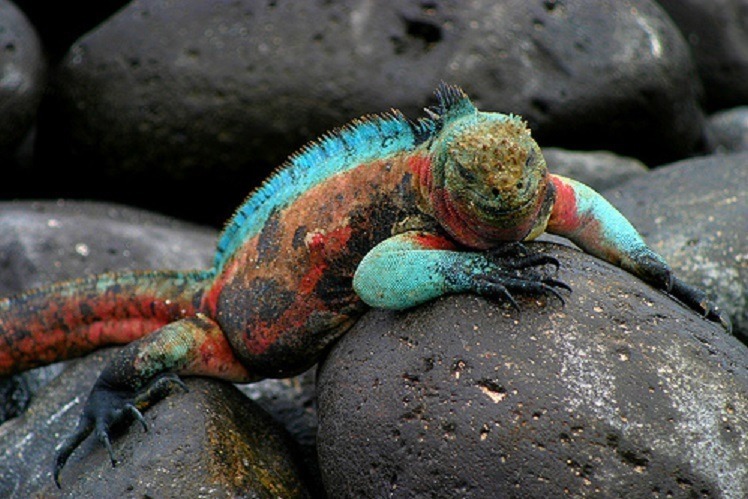 The largest, most primitive-looking race of marine iguanas are found mingling with sea lions and Sally Lightfoot Crabs; a wonderful opportunity to encounter Flightless Cormorants at their nesting sites, Galapagos Penguins and the “King” of predators on the Islands, the Galapagos Hawk. “Pa-hoe-hoe” and “AA” lava formations cover the majority of the terrain. Vegetation is thus scarce inland, but we encounter Brachycereus cacti and extensive mangrove beds lining the shores. Afternoon: Vicente Roca Point (Isabela Island). Great deep-water snorkeling at one of the richest marine havens on Earth (Bolívar Channel). We take a dinghy ride along the coast to observe a great diversity of sea and coastal birds; Nazca and blue-footed boobies, noddies, brown pelicans, penguins, flightless cormorants. The upwelling of cold water currents in this part of the Galapagos gives rise to an abundance of marine life. Highlands (Santa Cruz). Dry landing. A 45-minute bus ride will take us to the Santa Cruz highlands, located to the northwest of Puerto Ayora, where we will find a natural reserve with giant tortoises. These enormous and slow-moving reptiles are responsible for the island’s name and therefore approaching them in their humid and forested abode is always an inspiring adventure. They can weigh between 250 and 300 kg and can live up to 150-200 years. Flight to Quito or Guayaquil on day 10. International flights may depart any time after 5:00pm. Machu Picchu & Galapagos is a ten-day tour which includes cruise on a ship, walking around ruins and during city tours. As always, a certain patience is required for the inconsistencies and occasional delays of developing-world travel. Private Lima city tour If flight schedules allow including entrance fees, private vehicle, driver and professional guide. Galapagos National Park Tax – US$100.00, US$50 for children under 12.
International flights, pre- & post- tour accommodation, visas, vaccinations, personal insurance, meals except where specified above, drinks, laundry, souvenirs, tips while on optional excursions and other items of a personal nature. Medical travel insurance is not included through Southern Crossings, cancellation insurance is advisable. Wet suit – optional (US$ 25.00 for the whole tour). Alcoholic and non-alcoholic beverages, not including water which is provided. Medical Services, travel insurance and other not specified. In Quito/ Guayaquil/Lima/Cusco/Machu Picchu: $160 double/$140 single. Add extra activities such as river rafting, horseback riding, mountain biking, hiking, climbing and free days to your custom itinerary. Ask about these options and we’d be happy to add them to your quote. If you have any special requests or interests like birding, cooking or crafting that you would like to explore please let us know! This tour includes 3 star hotels and interior cabins. We would be happy to give you an upgrade to four or five star. If you would like to select a specific hotel let us know your preference. We can then work it into your custom itinerary. All travelers to Peru and Ecuador are required to have a passport valid for at least six months from date of entry. Visas are not required for E.U., U.S., Canadian, Australian or New Zealand passport holders. For other nationalities, please consult the nearest embassy or consulate. An onward ticket and proof of funds may also be required at entry and should be available to show to immigration. Traveler’s checks, currency, or a bank statement, from the bank or printed off the internet, are sufficient for proof of funds. No immunizations are required of travelers to these areas of Peru or Ecuador. Travelers may wish to receive hepatitis vaccinations and should be current on all other standard vaccinations. No areas visited on this trip are malarial or yellow fever zones. Please consult your physician or local health department for more information. It is best to bring from home such items as prescription medications, eyewear and care, unusual film and camera batteries. Please bring all used batteries home with you to recycle! For your international flights, please check with your airline. Within Peru and Ecuador, you are allowed 20 kilos (44 lbs) of checked baggage, as well as one carry-on and another small, purse-like item. The carry-on size regulations are the same as international carry-on size regulations. Cusco, the Sacred Valley and Quito: days are warm if sunny, slightly chilly if cloudy. Nights are chilly. Guayaquil and Galapagos Islands: hot and humid, rain always possible. The Galapagos Islands can have a cooler, more moderate climate depending on current conditions. The unit of currency in Peru is the nuevo sol. The unit of currency in Ecuador is the US dollar.